I. THE BEGINNINGS. A little bit over a hundred years ago, five young, adventurous women left their monastery in Tutzing, Germany. They sailed to the Far East - to a strange land they had never seen nor heard. They sailed in mid-August 1906 and arrived in Manila, on September 14, feast of the Exaltation of the Cross. From the harbor, they were led through a fishermen’s district along Moriones street in Tondo. Their first house consisted of three rooms. The pioneers were Sisters Ferdinanda Hoelzer, Winfrieda Mueller, Cresencia Veser, Petronila Keller and Novice Alexia Reudenauer. The prioress general of Tutzing Mother Birgitta Korff, OSB had received an urgent appeal from the Apostolic Nuncio to the Philippines, Dom Ambrosius Agius, OSB to please send some of her Sisters to the Philippines, soon! “Hundreds of thousands of children grow up without any instruction, “he wrote,” and thousands upon thousands must die without the sacraments.” Catholic schools were needed to remedy the religious ignorance among the population due to the lack of priests. The American government imposed separation of Church and State, and forbade the teaching of religion in the public schools. II. SITUATIONER. At the turn of the century from 1880 to 1906, the Church in the Philippines was in a crisis. Spain which had colonized the Philippines for 300 years (since 1521), was engaged in a war against the United States (an emerging power in the West). In 1898 Spain lost in the war. During the Treaty of Paris Spain ceded the Philippines to the United States. The United States in turn paid Spain $ 20,000. Spanish priests and religious left the country in large numbers. The Church faced a vacuum with only a few Filipino priests and Spanish friars. Within three months - December 3, 1906 - the sisters established a small school with 6 girls and 2 boys, who could afford to pay some fees. With the small amount of money they earned, they started a free school with 50 boys and girls from the neighbourhood. 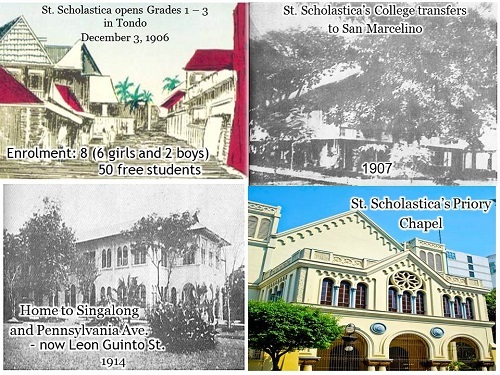 The school was later called St. Scholastica’s College. 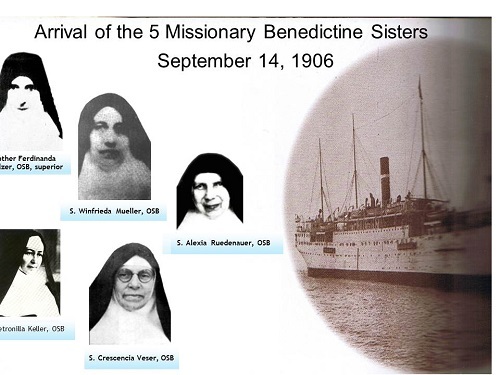 The missionary Benedictine pioneers had just one purpose: to spread faith in Jesus Christ. III. SAN MARCELINO (1907) After a year, the small house in Tondo was not big enough to accommodate the growing number of pupils. So they looked for another place and found on San Marcelino Street, quarters which formerly served as army barracks. The place was big enough to accommodate more students for the next seven years. SINGALONG 1911. The Bishop “sold a 3.5 hectare swampy land” in Singalong at a price of a song. The sisters supervised the clearing the field, filling up of pot holes, cutting down of thickets, and ridding the land of snakes. The student boarders and Sisters transferred to their new school and Priory house on Christmas Eve. PENNSYLVANIA AVENUE (1914). IV. WORLD WAR II: The Ravages of War (1941-45). 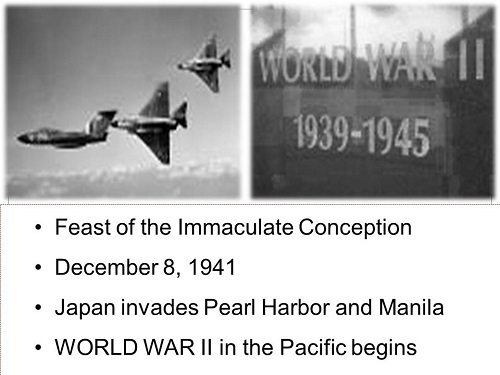 At the outbreak of World War II, the Japanese made their triumphal entry to Manila. St. Scholastica’s College was sealed as “property of the Japanese Imperial Forces.” Parts of the school were converted into a hospital. Sisters opened the school gates to welcome people who sought refuge in the concrete buildings of the school. Thus, St. Scholastica became the sanctuary for people suffering from the terrors of war. But on the fateful day of February 13, 1945, an incendiary bomb set St. Cecilia’s Conservatory of Music on fire. The other buildings followed, and razed to the ground. St. Scholastica’s buildings were all gone. But by God’s grace, all the Sisters in the campus were spared. V. RECONSTRUCTION. The Sisters who lived amidst the ruin of St. Scholastica’s had their vision of the buildings once more rising from the debris and prayed for the further fulfilment of their missionary dream. VI. EXPANSION AND DEVELOPMENT. More schools were founded. Tutzing sent more sisters to the Philippines. Local vocations began to grow and flourish. Perhaps this was mainly due to the pioneers’ Christian example and the way they did their service with great determination and unflagging devotion. They were missionary Benedictines who put emphasis on choir prayer, lectio divina, communal life and communal apostolate. VII. OUR FOUR-PRONGED THRUST. 1975. The Manila Priory adopted a four-pronged thrust which up to this day, influences the direction of the Priory. 1. That our institutional apostolates be socially oriented. 2. That we foster non-institutional apostolates. 3. That we initiate direct missionary work in the Philippines. 4. That we continue the sending of Filipina Sisters to the FOREIGN MISSIONS. VIII. MUSIC EDUCATION and WOMEN’S STUDIES. St. Scholastica’s College has become particularly well-known for its Music Education and Women’s Studies. The Conservatory has educated many pianists and music teachers, and continues to extend scholarship programs for poor but talented students. 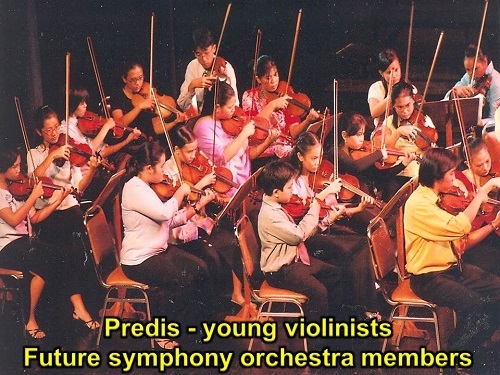 It has established a niche in the cultural history of Manila and continues to be active in the region’s cultural events. St. Scholastica’s College is considered a pioneer in Women’s Studies, not only in the Philippines but in Asia. The program engages in women’s advocacy, and offers courses in eco-feminism, women and spirituality, women and development, gender-fair education and lately, gender studies for men. IX. SUPER TYPHOON YOLANDA (HAIYAN) November 7, 2013. Super typhoon Yolanda (Haiyan) plowed across the cluster of islands in the heart of our country. It was one of the strongest tropical cyclone to hit land anywhere in the world in recorded history. It leveled entire villages, and left more than 7,300 people dead or missing. It displaced more than 4 million people, and damaged more than one million homes and buildings, including our two colleges, one hospital, and a retreat / seminar house in Ormoc,Tacloban and Alang-Alang . 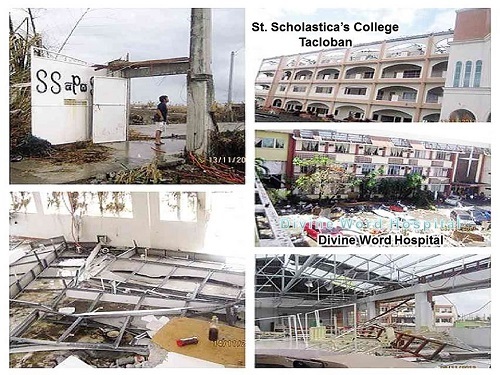 Ravaged were: St. Scholastica’s College, Tacloban; Divine Word Hospital, Tacloban; St. Peter’s Colege, Ormoc; and Alang-Alang Retreat/Seminar House. X. POPE FRANCIS ENERGIZES FILIPINO PEOPLE. JANUARY 15-19, 2015. The pope made his official visit fourteen months after Yolanda devastated the Visayas. He made it a point to visit the people of Tacloban, and see the ravages of Yolanda for himself. During the closing Mass at the Luneta before his return to Rome, some five million people gathered to see and hear him. It was a great moment of spiritual renewal and hope for the entire country. XI. TRANSFER TO THE NEW PRIORY HOUSE. DECEMBER 2014. Mother Adelaida Ygrubay, OSB, subprioress Sister Lydia Villegas, OSB and the rest of the community transferred to the new Priory House located at the serene cool place of Tagaytay. 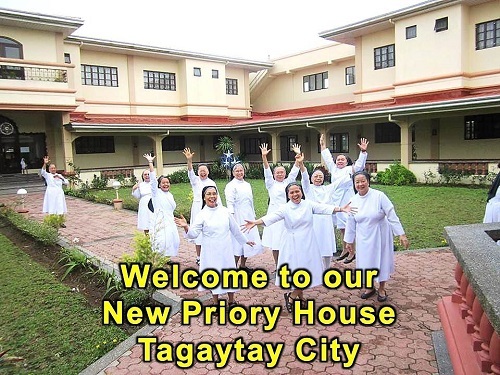 The Manila Priory as of 2015 is composed of 170 Sisters in twenty communities. We serve in 10 schools, 2 immersion communities, 2 hospitals, 3 retreat/seminar centers, 2 retirement homes, and 1 formation house. XII. OPTION FOR THE POOR. Pope Francis reminds us: “Jesus teaches us to put the needs of the poor ahead of our own.” While we give priority to the materially poor, as Jesus did, we take to heart also the sufferings of the victims of other forms of poverty. Such works today include - intensifying our work for women, ecology and family evangelization; training for new ministries to help victims of child abuse, dysfunctional families and AIDS; venturing into concrete work for farmers like promotion of sustainable agriculture, facilitating land security and acquisition, reforestation and preservation of watershed to ensure continuous water supply and soil conservation for food production.